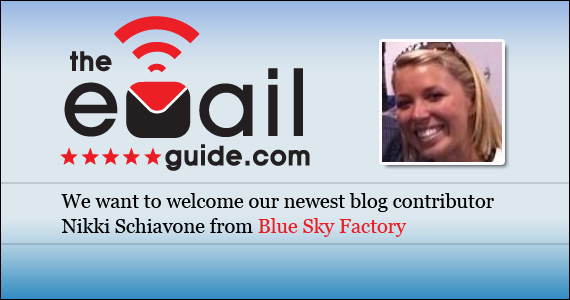 Welcome our newest blogger: Nikki Schiavone of Blue Sky Factory! I’m very proud of the team of experts we are building here at The eMail Guide and this week I know that pride will shine even brighter as we announce some more stellar additions to an already unbeatable line up! I’m pumped to be starting it off with a bang by announcing that Blue Sky Factory’s sales ace, Nikki Schiavone has joined our blogger rotation! Nikki is a player coach, she’s great at the game but, even better at spreading that knowledge around. You’ll find her posts to be entertaining and very informative. I’d buy those home plate season tickets now if I were you. Nikki Schiavone is an Email Marketing Sales Guru at Blue Sky Factory, a (pretty cool) email service provider based in Baltimore, MD. Nikki lives, eats and breaths email and can’t get enough of it. When she’s not dreaming about helping prospective clients, creating strategic solutions and blogging about best practices, she’s saving the world … Well not quite (we don’t want to blow her secret identity here), but you could probably find her out a networking event in Baltimore, throwing some iron around at the gym or having some vino with friends. Hey Nikki…Welcome aboard. Thrilled to have you on the team. Also special thanks to the great guys over at Blue Sky Factory for taking an active role in our community. We couldn’t do without everyone’s help. Yes! Great to have Nikki on the squad. She is definitely someone who is not only PUMPED about email marketing…she also really knows her stuff. We’re thrilled to have her on the Blue Sky Factory team too! P.S. Yeah. I know. I need to write another post! Great to have you with us Nikki!